1. Raise and support vehicle. Remove front wheels. Drain differential oil. Remove grease cap, cotter pin and lock cap. Apply brakes, and remove lock nut. Release brakes. 2. Using brass drift and hammer, tap on inner joint to separate from differential. Slide axle shaft toward steering knuckle until free of differential assembly. 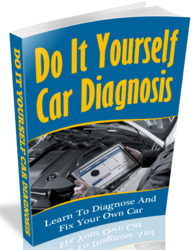 Use care not to damage oil seal, axle shaft, boots or Anti-Lock Brake System (ABS) speed sensor rotor (if equipped). Remove axle shaft. 3. Disconnect lower suspension arm. Push steering knuckle outward and remove driveshaft. Remove snap ring from inboard shaft. See Fig. 3 . Fig. 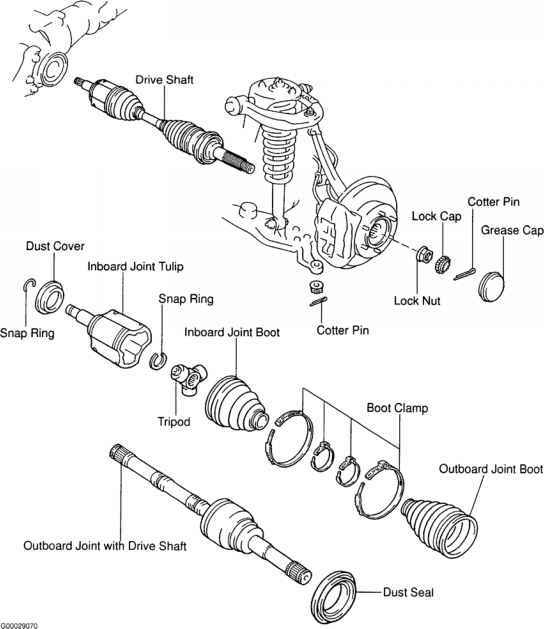 3: Exploded View Of Front Axle Shaft (Tacoma Shown; 4Runner Similar) Courtesy of TOYOTA MOTOR SALES, U.S.A., INC. Ensure no play exists in outboard joint. Inboard joint must slide smoothly in thrust direction and be free from excessive play in radial direction. Check for torn or damaged boots. 1. Remove CV joint boot clamps, and slide boots from joint. Paint alignment marks on CV joint housings, tripod and shaft(s) for reassembly reference. See Fig. 3 . 2. Remove inner housing from tripod joint and axle shaft. Remove snap ring from end of axle shaft retaining tripod joint. Paint reference marks on tripod joint and axle shaft for reassembly reference. 3. Using a hammer and brass drift, tap tripod joint from axle shaft. DO NOT tap on roller of tripod joint during removal. Remove boots from axle shaft. Using a screwdriver and hammer, remove dust shield from axle shaft. 1. To reassemble, reverse disassembly procedure. Install NEW dust seal on axle shaft. Wrap splines on axle shaft with tape to prevent damaging boots during installation. 2. Install NEW boots and NEW boot clamps on axle shaft. Install inboard tripod joint on axle shaft with beveled side toward outer joint. Ensure alignment marks align. Using Yellow grease supplied in overhaul kit, apply amount of grease specified to inboard joint. See GREASE CAPACITY SPECIFICATIONS . 3. Using Black grease supplied in overhaul kit, apply amount of grease specified to outboard joint. See GREASE CAPACITY SPECIFICATIONS . Assemble outboard boot onto CV joint. Set axle shaft to standard length. See AXLE SHAFT LENGTH SPECIFICATIONS table. See Fig. 4 . Install and tighten boot clamps. Fig. 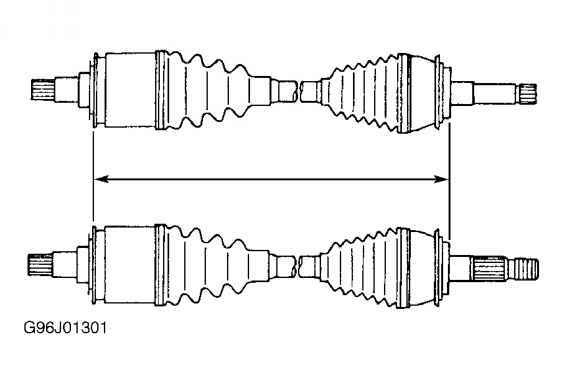 4: Measuring Axle Shaft Standard Length (Tacoma Shown; 4Runner Similar) Courtesy of TOYOTA MOTOR SALES, U.S.A., INC.
To install, reverse removal procedure using NEW gaskets. Coat surfaces of shaft at outer joint with grease before installing axle shaft. Ensure reference marks on axle shaft flange and differential assembly flange are aligned. To ensure proper engagement of snap ring, attempt to pull axle shaft out of differential by hand. Tighten fasteners to specifications. See TORQUE SPECIFICATIONS . How to remove upper balljoint from steering knuckle tacoma 2001? How to remove clamp on Toyota Tacoma rear driveshaft boot?